I started out with such high hopes, I really did. I intended on reviewing the Nashoba Valley Brewery Oktoberfest. I had two bottles, and both were flat. Flat as can be. You have no idea the level of frustration I felt, as I was really looking forward to reviewing it. Luckily, I bought a mix six pack and had a couple other brews to choose from, so I went with the Bolt 117. The Bolt 117 is essentially a better version of Coors. It poured a golden color with a slight cloudiness to it, with able head. The first thing you taste is the malt, with a secondary taste of a hint of fruit. Like I said, it's a slightly better version of Coors. The Octoberfest from Samuel Adams is one of my favorite fall beers. It has an excellent brownish-orange color, a full, malty aroma, and a smooth, rich taste. It is easy-drinking and definitely reminds me that autumn is on the way. However, when compared to other Octoberfest offerings, some of the lesser qualities of this beer are revealed. First, it is a bit too sweet, almost to the point of being sugar-syrupy. Second, the malts lean towards a toasted flavor, helping to give the beer its brown-bottle color. But the toasted malt flavor is somewhat overpowering, drowning out the hop flavors almost completely. Lastly, the ABV of 5.4% is fine, but I wonder if a higher ABV would help to cut into the sweetness. You almost want to drink something hoppy to chase away the sweet-malt taste. Despite the noted deficiencies, this beer is a classic American Octoberfest beer. It holds up well in comparison to Octoberfest beers from Germany, which is the highest compliment. Houston, we have a problem. Well, at least I hope it was a problem and it wasn't the beer itself. After perusing the shelves at my local liquor store (Murray's in Newton Center, great selection of beer and wine), picking up a complementary beer glass (customer appreciation and who doesn't love free stuff), and discussing our website with the owner, I choose the Affligem Tripel. I had high hopes, as I'm a huge fan of the Belgian beers and especially love those that have directions on how to poor, and at what temperature to serve, on the bottle. When I popped open the top (cork), I was hit with some excess head flowing out of the bottle, which is not a good sign. It did however, smell mostly of wheat with a hint of orange and a wee bit of spices, which is exactly what I was expecting. When poured into my glass, I was hit with a very healthy head (which I'm to believe isn't par for the course for this brew), too much really, but immediately noticed it's light amber color and got that tingle of excitement in my belly. The first sip was almost medicinal in flavor though, almost like a cough syrup. Not necessarily tasting like cough syrup, but feeling like it. It was pretty flavorful with the wheat being the dominant taste, but I think I got a bad bottle to be honest. Something just didn't feel quite right about it. The 9.5%abv, did make up for that though. I'm only going to give this beer a 2.5, but I'm reserving the right to come back and re-review it at a later date. I'd like to buy another bottle eventually and compare the two. 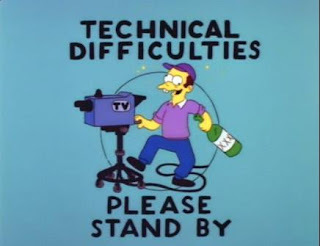 If it was half decent when not quite right, I'm hoping for something much better when all systems are a go. 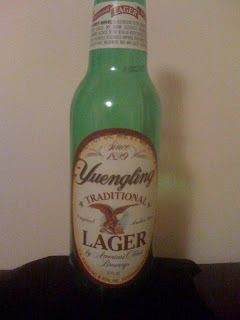 Now, if you have spent any time in the Mid Atlantic states, you will have heard of a little beer called Yuengling. Their distribution is limited, their reputation is not. Yuenling lays claim to an all important title, America's Oldest Brewery, since 1829. And people rave throughout the land to this beer's awesomeness. When poured into a standard pint glass, the lager has a light amber hue, and is populated with carbonation bubbles throughout. The ABV is a modest 4.9%. The taste is brief as you can grasp the amber malt but you're left smacking your lips looking for more flavor. The beer's reputation is bigger than its taste. Of course my friends will think this review is blasphemous, but it is they who are not true to themselves. Now, Pale Ale Guy skewed his review of Corona, more favorably due to the beer's reputation as a summer good time beer. I, however, feel that Yuengling needs to do more than just sell Americana. The Yuengling gets a 2.0. Right out of the bottle, it appears that this is going to be a good beer. It has a nice copper color and a bit of a white foam head. But, an odd metallic scent presents itself in the aroma. Not a good sign, and even worse, this metallic sensation continues into the flavor of the beer. It definitely has the characteristic malt flavor of an Octoberfest beer, but there is also the unwelcome metallic taste. The negative aspects are almost all in the aftertaste, and you can really get a feel for it as you swallow the beer. Maybe there is something wrong with the malt? At any rate, the aroma/taste issues definitely outweighed the positive aspects of this beer. Now on to the beer. Have you had this one before? 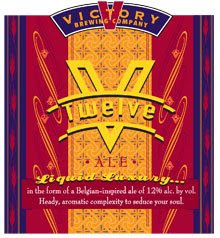 I'm a fan of Victory but I've never had the V-Twelve and I must say that I was pleasantly surprised . First off, it took me a good solid ten minutes to get the cork out of the bottle. Obviously, it had expanded too much, which made it quite difficult to remove. This is good because it means no air got into the bottle, but bad because it kept me from drinking the beer. Once opened and poured, a slight head rose in the glass, but didn't last long at all. It poured an amber color which thru me off, as I was expecting a lighter yellow. The first sips presented a high amount of spice to the taste buds, but not in an overpowering way. It went down quite smooth actually. However at the bottom of the bottle, I found the flavor to be dominated by fruits, with the spices taking a back seat. Odd, but still tasty. Other than shaking the bottle before opening (which is a very bad idea), I'm not entirely sure how to get the flavor to even out though. At 12%abv, the buzz hits you immediately, which is great for a Friday, and even better after a long day at work. I'm going to give it a solid 3.5 rating. It was very good, but I've had better, and I'm trying not to let the 12% cloud my judgement. And if you do buy it, I promise you won't be disappointed. OK, you know I am brand loyal to a fault, especially when it comes to Lagunitas’ beers. 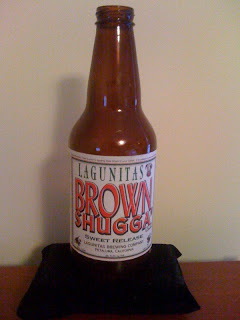 So it was no surprise that I picked up the Lagunitas Brown Shugga’. Now for those who are unfamiliar with Lagunitas beers, they are located in Petaluma California which has a bit of a reputation for drugs. The owners of the brewery have a little fun with this reputation and definitely use it in their marketing; so much fun in fact that it launched an undercover government investigation at several of their tastings. One drug bust later and they were suspended for brewing for 20 days. Their humor unfazed, they released the Undercover Investigation Shutdown Ale as a remembrance of that event. For those uninitiated in the drug subculture, brown sugar is a street name for heroin. And to continue along those lines, The Brown Shugga’ would definitely be considered a “hot shot” with its 9.5% ABV. The Brown Shugga’ comes out of the bottle a shade of cherry and brown. The viscosity of the beer is silky, a sure sign to me that this beer is packing an alcoholic punch. While the alcohol is not overpowering, you can sense its presence in each sip you take. There is also a tang of bitterness, but once again not much. The malt flavor is a brown sugary delight, combined with the hops it is reminiscent of a caramel apple you’d get at a county fair. I found the Brown Shugga’ to be quite addicting, much like its heroin counterpart, I blame this on the sugary base of the beer. In fact I liked it so much I had another right away. Of course with the aforementioned 9.5% ABV, it knocks you down pretty quick. Now for those unfamiliar with my rating style, it can be found here. This is a little important because as you see from the Lagunitas website, this beer is not available until October 2009. So how did I get a bottle of it early? I didn’t. I loved this beer so much last winter, I stocked up on it so I’d never run out. How I avoided reviewing it so far, I am not sure. So as far as a rating goes, I am gonna have to give it the illustrious 5.0. If I were you, I’d keep an eye out this October when this beer arrives on shelves, a good indicator whether your store will carry it or not is if they carry any of the year round beers from Lagunitas. In the great words of the Campbell's soup people... mmm mmm good. Southern Tier is new to me. I've never heard of them, and never tasted anything they've put out. This however, makes me want to try more. Pumking Imperial is a pumpkin ale that is just exploding with flavor. When first poured, it gives off a healthy head, not too much where it overflows the glass, but not so little where it worries you. A nice healthy amber color really caught my attention at the first pour. What really hit me though... the smell. Take a whiff after you pour that first glass. WOW. One scent and all I thought was harvest ale, Thanksgiving, fall. The cinnamon just jumped out at me and I thought it might overwhelm the flavor, but it didn't, it hit the pallet perfectly. At 9%abv, it does provide a nice little kick, and after a quick two glasses I can personally attest to it. I've always been a fan of October beers, with a love of the spice-y harvest brews. For my money, the Dogfish Head Punkin was the best. This one however, has just surpassed it and jumped to the top of the heap. 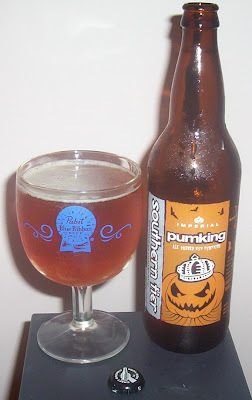 I'm going to give Pumking a way above average 4 rating, and I highly recommend you try it. If you can't find it at your local beer store, just let me know and I'll pick you up a bottle myself. Now, while back, I introduced many of you to DPA, perhaps the finest beer ever produced in a can. Many of you were doubters, but were believers after trying it. I am here to introduce you once again to a great can of beer, The 21st Amendment Brew Free or Die IPA. Now with a name like that, you expect the beer to come out of New Hampshire, but in actuality it comes from the left Coast, San Francisco. The Brew Free or Die isn’t overly bitter, but it does have a kick of bitterness. The taste more resembles a heavy IPA as compared to an IPA. The 7% ABV is a bit overpowering and dominates a solid malt flavor. And more importantly, it did not explode all over me like the Elm City Lager. Now, I am not saying this is a 5.0 beer, it’s not, but it’s a solid addition to the IPA family. The Brew Free or Die IPA gets a well deserving 3.5. Octoberfest beers are lagers that are brewed in a traditional German style, or at least in a way that mimics the traditional brewing techniques. Most Octoberfest beers have a prominent and usually sweet malt flavor with very little hop presence (i.e., neither the aroma nor taste of hops). The color is usually copper/amber brown, though some are more like a golden yellow. There are many, many Octoberfest beers available, and I'm going to review what I can between now and November. (Note: all of the Octoberfest reviews on Beer Crusade can be found here.) If you have a favorite brewer, check to see if they make an Octoberfest beer. You might be pleasantly surprised. 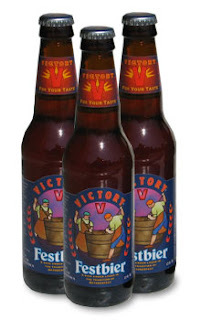 Festbier from Victory Brewing Co. won a gold medal at the 2007 Great American Beer Festival in the "German Style Octoberfest" category, so we are starting the reviews off with a strong candidate. Victory brews this beer with European malts and hops, probably trying to capture the essence of the original Octoberfest ingredients. The rich amber color and sweet malt aroma are terrific and inviting, and the first taste does not disappoint. However, as you swallow the beer, there is an interesting flavor, like toasted malt, which gives this beer a decidedly different finish. It could be from whatever yeast they are using, or they could be lightly toasting some of their grains, or it could be something else. Either way, it is a bit unexpected. Like most Octoberfest beers, this one is very easy on the palate, and the ABV of 5.6% makes it pretty easy to drink. Grab a six pack, as you will probably want more than one. Are you getting what you pay for? Apparently not, according to this website, bartenders are screwing you out of 25% of your draught beers because they don't fill it to the top. Outrageous I say. So checkout http://thebeergauge.com/ and read up on this travesty. Thanks to Mike F for passing this along. One of my favorite beer bars, The Yard House, is coming to Dedham, MA in April 2010. Clear your calendars, sign up your DDs and we'll make a trip out of it. Remember Linus from the Peanuts comic strip? Remember how he always had his blanky that he carried around with him? Well Allagash White is my blanky. Whenever I'm feeling blue, feeling a little out of sorts, this fine Belgium white always manages to lift my spirits. Brewed in Portland, Maine, this beer is my go to white. Tonight, I had it on tap, which is the preferred method. There isn't much head to the brew, but that's just fine by me. The first thing you notice is it's cloudy yellow color, but upon lifting it to your mouth for that first sip the scent of citrus immediately tingles your nose. That first sip goes down smooth with a hint of bitterness; not too much, just the right amount. At 5%abv, it's not overly powerful, but this is a beer you drink for the flavor, not the buzz. Overall, I'm giving this beer a very solid 3.5. I'd like to go higher, but it's not quite a 4 in my mind, so a 3.5 will have to do. If you're not a fan of the Belgian's or their beer, I suggest giving Allagash a whirl, it just might change your mind.